It's Monday again and it's November already. Can't believe how quick the time passed and we are almost at the end of the year. Today's bento is quick & simple one. I used twin round bento box. 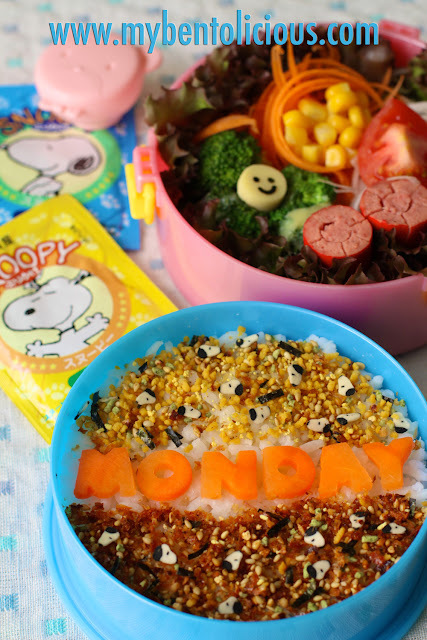 The content for the top box was steamed rice sprinkled with Snoopy Furikake and decorated with carrots alphabets. The furikake itself had 2 flavors, tamago and bonito. My kids love this Snoopy Furikake because inside the package it also contains small Snoopy flakes. I also put curry tuna at the bottom of the steamed rice, made them invisible. For the bottom box, I filled it with sausages, salad (corn-shredded carrots-shredded radish-tomato), and cheese broccoli. The salad dressing was put on the small container. Happy Monday!! @Gina : Dulu di Food Hall Sogo ada jual Gin, tapi semenjak distributor makanan Jepang problem dari tahun lalu sudah nggak kelihatan. Yg ada sekarang Korean punya dalam pack gede cuman rasanya beda ama yg Jepang. Aku suka nitip beli kalo suami atau temen ke Singapore (paling deket soale), di Takashimaya atau iSetan suka ada yg sachet lucu kayak Snoopy, Hello Kitty, Mickey Mouse, Pooh etc. Nice bento Lia.. I love the snoopy furikake, never seen this kind of cute little stuff before, they are too cute to me..haha.. Such a cute bento! Love the snoopy furikake!